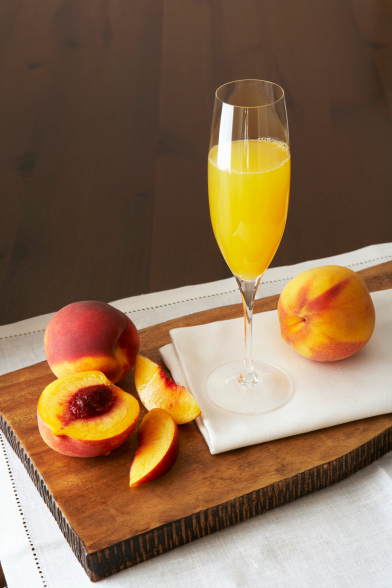 A fresh and sweet sparkling cocktail, the peach bellini imparts tantalizing, bright flavors, and the recipe is a cinch to make! Hailing from Venice, Italy the bellini originally achieved its’ pretty pink hue using a splash of cherry or raspberry juice. Now the cocktail is traditionally served using a mix of sparkling wine (such as Prosecco) gently stirred with fresh white peach puree. Step 1: Pour 1 glass of Prosecco in to a chilled flute. TIP: Although other sparkling wines can be substituted in the place of Prosecco, avoid rich wines like French champagnes that don't match the cocktail's bright and fruity flavors.